Yemeni internationally-recognized government cannot build actual partnership with the Saudi-led coalition, Foreign Minister Khalid al-Yamani has said admitting imperfection in relations the Arab coalition supporting his government. "Who is responsible for this defect? Is it our fault or the coalition's?" he told the Arabic Independent paper, stressing that flaw "should be found to repair relations and establish real partnership improving the look of freed provinces and presenting better example different from Houthi-held areas." 'Yemeni President Abd Rabbu Mansour Hadi tries to tune the government-coalition relations so as to achieve the declared objective of restoring the legitimacy," he added. Yemen has been racked by bloody conflict between the Saudi-backed government and the Iranian-backed Houthis who have taken over Sana'a the capital and most populated areas in the north since late in 2014, triggering what the UN dub as the world's worst humanitarian crisis. Yemeni FM admitted the presence of "uncontrolled militias trying to hide themselves behind political agendas" in areas held by the government but out of its authority. The government, in cooperation with partners in the coalition, seeks to integrate these militias into Yemeni security and army forces, he said. Yamani, however, labeled those calling for end of coalition operations as radicals lacking sight. Coalition "will last to make strategic difference in Yemen and the region ... Rushed accusations serve neither legitimacy nor Yemeni people." Three senior officials in Hadi government have recently escalated strong-worded criticism against the United Arab Emirates, with some calling for the "confused" relations to be corrected or alliance broken off with Abu Dhabi. 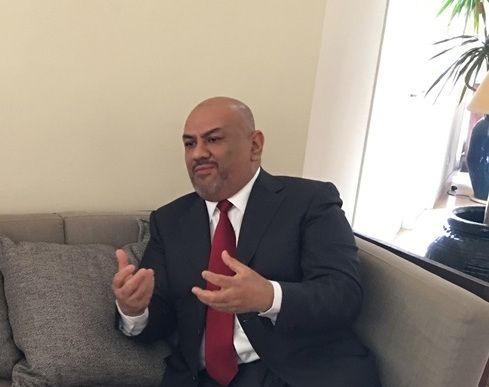 Saleh Soma'e, Mahweet governor loyal to Hadi, has called for that party to be excluded from the coalition, without naming the UAE, which he has accused of causing "all defeats suffered by legitimacy." Last February, Yemeni deputy premier and interior minister Ahmed al-Maysari said the imperfect relation needed to corrected, arguing that his ministry's authorities over Aden security have been disputed by outsiders. The UAE is a key player in the Saudi-led coalition that intervened militarily in the country in March 2015 to reinstate the government of President Hadi. The UAE formed, trained and equipped many Yemeni military and security divisions to fight Houthis but also al-Qaeda that exploited civil war to expand its influence in the south, although the gulf state claims the group was forced out. These remarks reveal that the UAE is no longer a strategic ally for Hadi government, Yemeni observers say, noting that the Gulf state is now the decision-maker in Aden, seat of official government. Early last year, Yemeni government relation with the UAE saw critical turn, as pro-government and UAE-backed forces engaged in violent infighting in Aden, leaving scores killed and ending up with control of the latter over the port city. Riyadh has intervened to ease the tension that has reoccurred with UAE deploying troops in Socotra Island, pushing the government to threaten of referring the issue to the UN Security Council, before those troops have withdrawn.